Please note: If you found your way here via Google, Ravelry, or other search engine, I appreciate you kind comments. I am not, however, affiliated with Knit Picks. I don’t know where the pattern is available. I will not copy the pattern or charts for your use, nor is my copy of the pattern for sale. Emails that ask me to violate copyright, ask me to sell the pattern, or ask for sourcing info will be deleted without response. Please contact Knit Picks to request information regarding the pattern, the kit, or the designer. 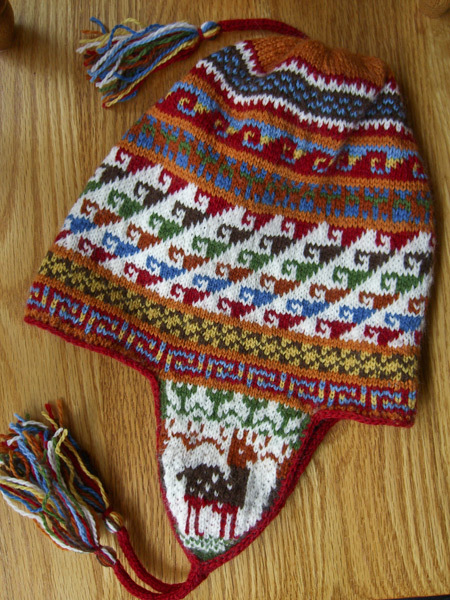 This is the Andean Chullo Hat Kit from Knit Picks. 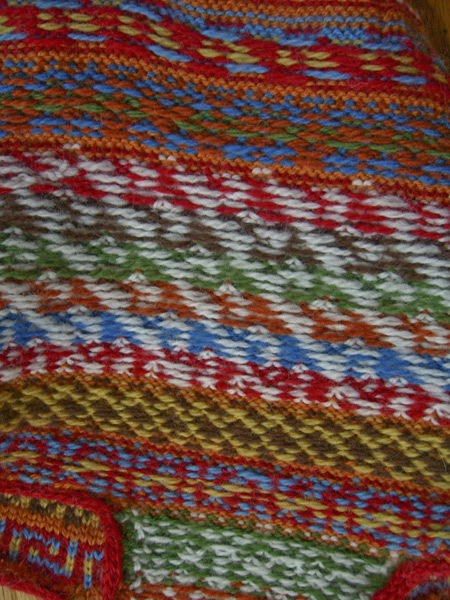 It became the first finished object of 2009 because I was up until the wee hours weaving in little ends that I stupidly did not weave in as I went. And there were a @%#! bunch of them, gentle reader. After sleeping for a few hours, the hat got a very quick steam-block, which fortunately turned out to be all it needed. I sewed the tassels on in between dinner preparations and such. It was finished, photoed and wrapped about an hour before #1 Son showed up for dinner. Whew. #1 Son’s take: Mom! you are really rockin’ this knitting stuff! This is the best hat ever, and it fits perfectly. Look at the little alpacas on the earflaps! Too cute! My friends are going to be so jealous. They couldn’t believe all the kitted stuff from you that I wore when it was cold and snowy. [ed. that warms the cockles of my heart! what more could a mom want to hear?] So you had to finish this and is that the reason I couldn’t come up on Christmas? [ed. No! that wasn’t it at all!] Haha… Oh, yeah… there was this snow thing, huh. Yarn: Knit Picks Pallette included in the kit – 100% Peruvian Highland Wool, 231 yds/50 gr per ball – portions of 9 colorways: Sweet Potato, White, Bark, Semolina, Pimento, Blue, Clover, Masala and Pool. There’s plenty left over for another hat, or two, or three. Modifications: none. Really. The pattern is a choose your own adventure. You pick one of two earflap charts, four of six pattern band charts, and one of two different hat top charts. Colors are suggested but not dictated and I did change one or two. And for those of you just dying to see the inside (you know who you are), here you go. 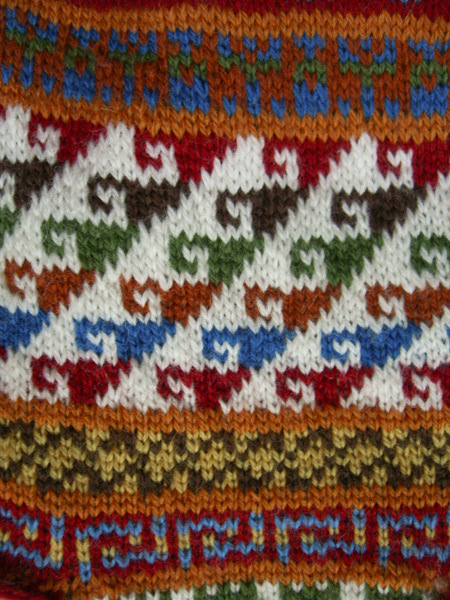 I’m a two-handed fair-isle knitter — that is I hold one color in my left hand and pick it, and the other color in my right and throw it. Philosopher’s Wool has a wonderful video that shows this technique. Their technique recommends not having floats longer than two stitches. On this hat I have floats up to 5 stitches. Do watch their video if you have not done so before. Their weaving stitches are very cool. 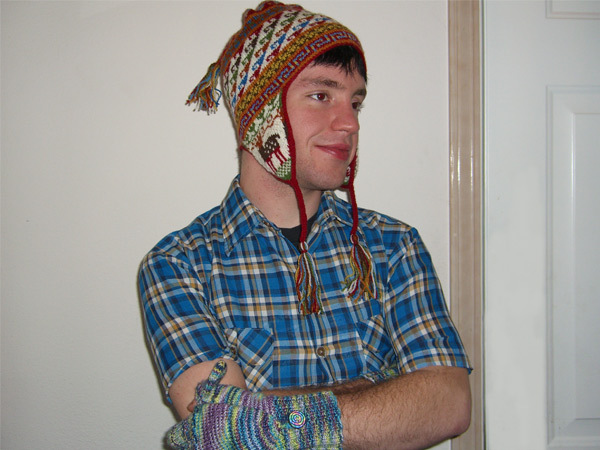 I will probably knit another of these hats and be a bit more adventurous with the colors. The kit came with enough yarn to knit several. Happy #1 Son with his hat and mittens. 😀 He wore the hat for a goodly portion of the time he was here, so I think it was very successful.